The Felix Kulpa Gallery is thrilled to present their newest exhibition, Anteater to Zorilla: A Second Alphabet of Oddball Animals Exhibition, showcasing the works of Peter Koronakos. A master craftsman with a fine eye for detail, Peter is also a connoisseur of interesting junk which can be seen in the way in which he can transform found objects into playful animals. 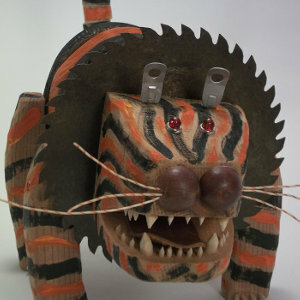 He has created animal sculptures for the last 15 years, and has exhibited his sculptures locally and nationally.